The Slope tool identifies the steepness at each cell of a raster surface. The lower the slope value, the flatter the terrain; the higher the slope value, the steeper the terrain. The output slope raster can be calculated in two types of units, degrees or percent (percent rise). The percent rise can be better understood if you consider it as the rise divided by the run, multiplied by 100. Consider triangle B below. When the angle is 45 degrees, the rise is equal to the run, and the percent rise is 100 percent. As the slope angle approaches vertical (90 degrees), as in triangle C, the percent rise begins to approach infinity. Comparing values for slope in degrees versus percent. The Slope tool is most frequently run on an elevation dataset as the following images show. Steeper slopes are shaded darker brown on the output slope raster. The tool can also be used with other types of continuous data, such as population, to identify sharp changes in value. Two methods are available for slope computation. You can choose between performing Planar or Geodesic calculations with the Method parameter. For the planar method, the slope is measured as the maximum rate of change in value from a cell to its immediate neighbors. The calculation is performed on a projected flat plane using a 2D Cartesian coordinate system. The slope value is calculated using the average maximum technique (Burrough, 1998). 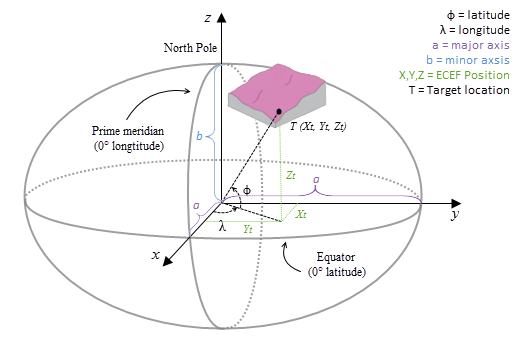 With the geodesic method, the calculation will be performed in a 3D Cartesian coordinate system by considering the shape of earth as an ellipsoid. The slope value is calculated by measuring the angle between topographic surface and the referenced datum. Both planar and geodesic computations are performed using a 3 by 3 cell neighborhood (moving window). For each neighborhood, if the processing (center) cell is NoData, the output is NoData. The computation also requires at least seven cells neighboring the processing cell have valid values. If there are fewer than seven valid cells, the calculation will not be performed, and the output at that processing cell will be NoData. For each cell, the tool calculates the maximum rate of change in value from that cell to its neighbors. Basically, the maximum change in elevation over the distance between the cell and its eight neighbors identifies the steepest downhill descent from the cell. The value 57.29578 shown here is a truncated version of the result from 180/pi. The values of the center cell and its eight neighbors determine the horizontal and vertical deltas. The neighbors are identified as letters from a to i, with e representing the cell for which the aspect is being calculated. wght1 and wght2 are the horizontal weighted counts of valid cells. c, f, and i all have valid values, wght1 = (1+2*1+1) = 4.
i is NoData, wght1 = (1+2*1+0) = 3.
f is NoData, wght1 = (1+2*0+1) = 2. Similar logic applies to wght2, except the neighbor locations are a, d, and g.
wght3 and wght4 are the same concept as in the [dz/dx] computation. As an example, the slope value of the center cell of the moving window shown below will be calculated. The integer slope value for cell e is 75 degrees. The ECEF coordinate system is a 3D right-handed Cartesian coordinate system with the center of the earth as the origin, where any location is represented by X, Y and Z coordinates. See the following figure for an example of a target location T expressed with geocentric coordinates. The surface raster is transformed from the input coordinate system into a 3D geocentric coordinate system. The geodesic computation uses an X, Y, Z coordinate that is calculated based on its geodetic coordinates (latitude φ, longitude λ, height h). If the coordinate system of the input surface raster is a projected coordinate system (PCS), the raster is first re-projected to a geographical coordinate system (GCS) where each location has a geodetic coordinate, and then transformed to the ECEF coordinate system. The height h (z-value) is the ellipsoid height referenced to the ellipsoid surface. See the illustration graphic below. The ellipsoid height h is in meters in the above formulas. If your input raster's z-unit is specified in any other unit, it will be internally transformed to meter. The geodesic slope is the angle formed between the topographic surface and the ellipsoid surface. 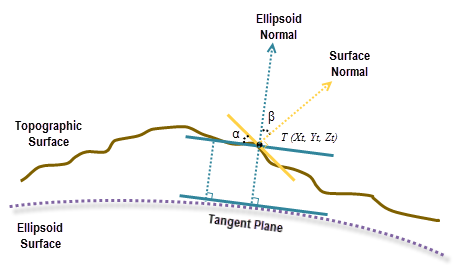 Any surface parallel to the ellipsoid surface has a slope of 0. To calculate the slope at each location, a 3 by 3 cell neighborhood plane is fitted around each processing cell using the Least Squares Method (LSM). The best fit in the LSM minimizes the sum of squared difference (dzi) between the actual z-value and the fitted z-value. See the illustration below for an example. Here, the plane is represented as z = Ax + By + C. For each cell center, dzi is the difference between the actual z-value and the fitted z-value. The plane is best fitted when ∑9i=1dzi2 is minimized. After the plane is fitted, a surface normal is calculated at the cell location. 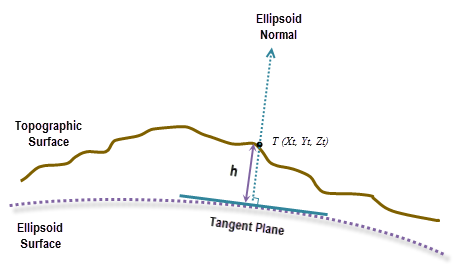 At the same location, an ellipsoid normal perpendicular to the tangent plane of the ellipsoid surface is also calculated. The slope, in degrees, is calculated from the angle between the ellipsoid normal and the topographic surface normal, represented as β here. From the illustration above, the angle α is the geodesic slope, which is the same as angle β, pursuant to the law of congruent geometry. For the Geodesic method, this tool is capable of delivering increased performance if you have certain GPU hardware installed on your system. See the GPU Processing with Spatial Analyst section for details on how this is supported, how to configure it, and how to enable it. Burrough, P. A., and McDonell, R. A., 1998. Principles of Geographical Information Systems (Oxford University Press, New York), 190 pp. B. Hofmann-Wellenhof, H. Lichtenegger and J. Collins, 2001. GPS - theory and practice. Section 10.2.1. p. 282. David Eberly 1999. 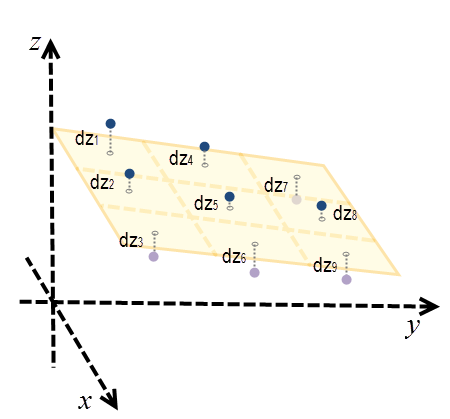 Least Squares Fitting of Data (Geometric Tools, LLC), pp. 3.